eClinical solutions is a platform integrating technology, products and services for conducting and automating the clinical trials to better enable the data management and integrating different trial data for efficient observation. Thus, improving efficiency and boosting the speed of clinical trials process. With increase in complexity, volume of clinical trial data, cost for gathering data, organizing and analyzing of study data and regulatory necessities for better safety monitoring are also expanding exponentially. To handle these tasks eClinical solutions are required to lessen development costs, support quicker decisions for prospective new products, and increase efficiency during the clinical trial process. There are various factors responsible for future growth of this market, which include technological advancement, globalization of clinical trials, cost effectiveness, better efficiency and accuracy offered by eClinical solutions. An improved user-friendliness of software and compliance benefits will increase the acceptance and penetration of eClinical solutions. This report provides information on eClinical solutions market size for the year 2014-2016, and forecast of the same for year 2021. 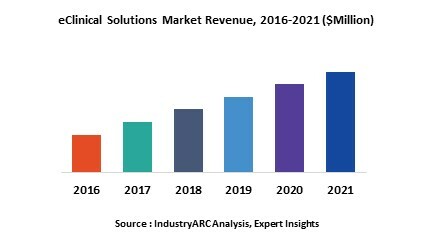 It also focuses on market drivers, challenges, restraints, market dynamics, growth indicators, competitive landscape, potential growth opportunities and other key aspects with respect to eClinical solution market. United States and Europe remain the potential markets for eClinical solutions, as there are an increasing number of clinical trials undergoing in this region, focus of pharmaceutical companies to conduct clinical trials globally and integrating large amount of data and increased adoption of eClinical solutions. APAC region is just adopting and there is a large scope for market growth in this region due to the presence of good number of clinical research organizations.